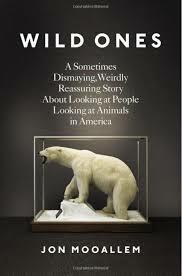 Wild Ones by Jon Mooallem was an interesting book with the equally interesting and long subtitle A Sometimes Dismaying, Weirdly Reassuring Story About Looking at People Looking at Animals in America. Mooallem wrote early on of his four year-old daughter who possesses untold numbers of animal themed items and apparel and how when she's an adult, her exposure to animals as an adult may be different than ours with many species on the road to extinction. Mooallem in the introduction described Wild Ones as being about "finding yourself straddling those two animal worlds- a little kid's and the actual one- and trying to understand both." 1. Bears - This was specific to polar bears, particularly the population of polar bears around Churchill, Manitoba and interesting from Mooallem was his description of how the polar bear became more of a symbol than anything else. 2. Butterflies - Also covered were conservation efforts around the Lange's metalmark butterfly which lives only in the Antioch Dunes National Wildlife Refuge in California. It was fascinating reading here of the efforts to preserve the species and how cause and effect often has led to unintended consequences for the Lange's metalmark. Along these same lines of profiling efforts where many species are staying alive only due to our herculean efforts, Mooallem towards the end of the book told the story of Phil Pister, who in 1969 saved the Owen’s pupfish species from extinction (true, almost nobody has heard of the thing, but it was compelling reading on one guy saving a species from extinction). The quotes from Pennypacker and story on Pister illustrate a point from the book about how it not a question of whether we're playing God in animal conservation efforts, but how far we want to go in playing God in relation to our intervention. Closely related to this is another key point (this the quasi-optimistic one) about how even if our efforts ultimately futile, there's something to be said for just doing something and trying to help. Two additional things from Mooallem in the book that stood out to me as particularly interesting were around our perception of animal counts and young kids in relation to animals. In relation to how many animals there should be of a particular species, Mooallem wrote about the concept of shifting baselines syndrome- basically creating a "new normal". In animal species count terms, you don't see many for a while, then you see a few so you feel that you've seen... a lot. His point is that especially when it's considered what things were like in the past, it's tough to say what the count of a species actually "should be." Mooallem early on in the book wrote of his young daughter and makes the point that we as adults want to view kids as like animals, free and innocent, but one trait shared by kids and animals is that of self-interest. Referenced by Mooallem and quoted in the book was a social ecologist from Yale, Stephen Kellert, who wrote of how young kids aren't born with a relationship with the natural world and desire to preserve it. That mentality would have to develop over time and until it does, kids will see the natural world as simply something that provides, rather than has to be nurtured. It's a fairly brief and interesting part of the book that makes me think of how kids want what they want, we as parents don't have to give it to them, but we can't fault them for wanting or asking. All in all, it's a solid book that Mooallem noted as coming out of his New York Times Magazine 2009 story "Rescue Flight" on the group featured in the whooping crane section, Operation Migration. Additionally, Mooallem wrote of first visiting Churchill, Manitoba in 2005 while at the UC Berkeley Journalism School and the back jacket of the book mentions him working with the tremendously interesting sounding San Francisco based Pop-Up Magazine, which has creative types putting together a 100-minute live magazine performance on stage for an audience.